This page features environmental portraits shot on medium format film of a handful of WPC members by Louise Contino (Project Director), and includes corresponding audio tracks of firsthand recordings of the featured members' stories and songs. Here the camera is reversed in the opposite direction and the WPC members experience what is like to be the subject rather than author of the image-making process. In return, you gain an opportunity to peer into their lives and gain a richer understanding of who really was behind the lens and what their perspective really looked like when creating The Collection. The recommended way to optimize to take this "closer look" into the lives of WPC members is to first click play on the audio track of your choosing and then click on the corresponding image featured above the selected audio track. This will enlarge the portrait to full-screen and allow you to focus-in, making eye contact with the person speaking as you listen. This works best on desktop and laptop computers; however mobile and tablet users should also enjoy exploring the content as well. All photographs below are available to purchase as a fundraiser for the people of Wanteete in the Print Shop. The people of Wanteete primarily work as farmers, and like so many subsistence farmers living well below the poverty line they work incredibly hard for very little money. The soil is extremely fertile and rich in Uganda and the food is abundant, but without access to economically viable markets it is very difficult for people to receive a fair exchange for their agrarian goods and labor. Nalubowa Annet and Nassali Marriam along the back path leading to their gardens, posed under a "fene" (jackfruit) tree. These two women are close companions through life. They are next door neighbors, each with six children, and are raising their families as if related. Nassali Marriam is a major contributing member to a fair trade coffee cooperative, and Annet Nalubowa manages a small dairy business. WPC members (from left to right) Anyango Florence, Mpiima Zacharious, and Athieno Vena. These two women are sisters who have joined together to form a nontraditional family. They are raising their nephew in the middle, Mpiima, as their own son because he lost both of his parents at a young age. Both Florence and Vena are teachers at BESO Junior School and Mpiima excels in his studies thanks to their support. Jamadah Mawoni standing outside his home after his workday as a teacher at BESO Junior School down the road. Jamadah is a determined and caring man that lets no obstacle stand in the way of his commitment to education. He is a single father at age 21, which is unusual in Uganda, and works hard to provide the best for his son. He is a serious man, yet has a booming laughter that can easily fill a room. WPC members (from left to right) Athieno Jane and Waiswa John standing in Jane’s garden after a long photo-walk. WPC President Waiswa John standing in front of his corn fields. Here is our WPC President in all his glory and ebullience. Waiswa was a consistent source of positivity and wisdom who consistently brought grace and humor to our collective. He is a strong community leader committed to facilitating agricultural improvement projects in Wanteete; including the construction of a grain grinding mill, and a major reforestation project. He also is the treasurer of the Savings and Credit Cooperative (SACCO) that the WPC started last year from the money they earned through the sale of their photographs. 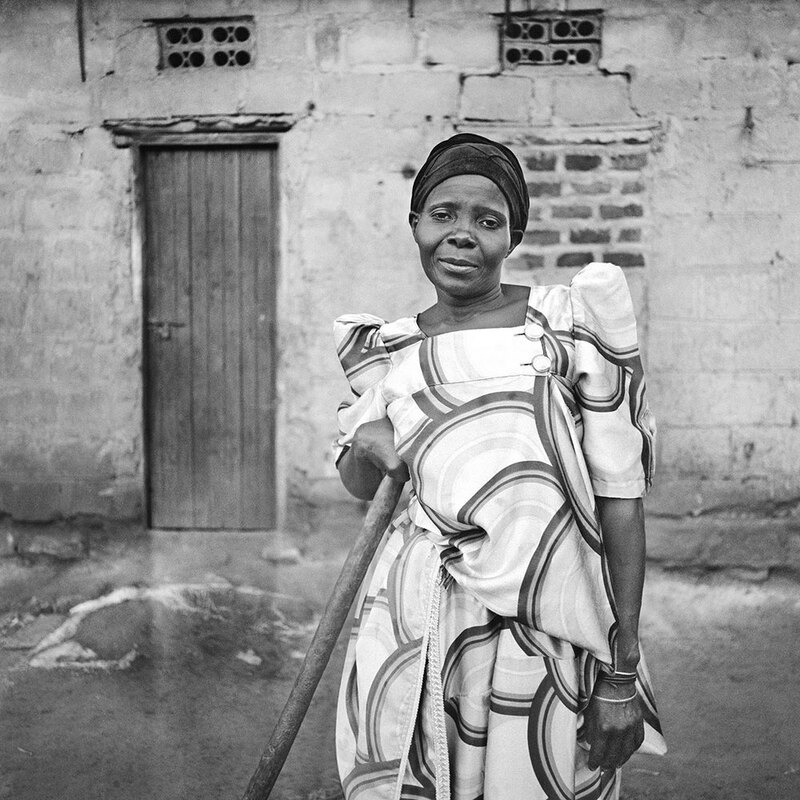 Nalongo Bukenya standing in front of her home. 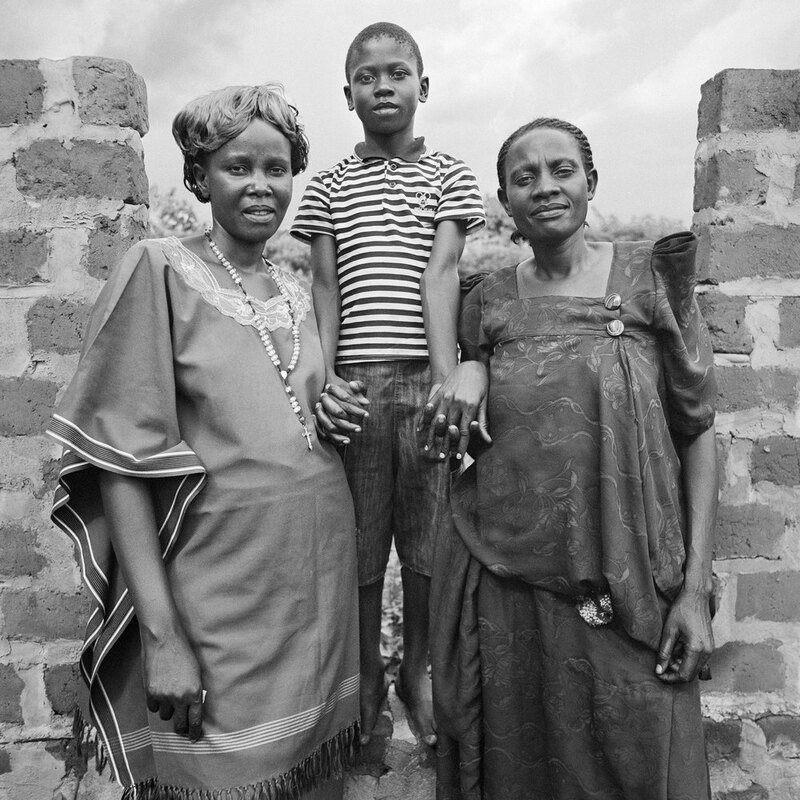 Nalongo is the name given in the local language Luganda to women who give birth to twins. It is a name that designates great respect in the community. Nalongo Bukenya had eight children in total and serves as the resident JaJa (grandmother) for practically every child in Wanteete. There is always a minimum of ten children in her courtyard and she is delights in feeding and doting on each and every one. 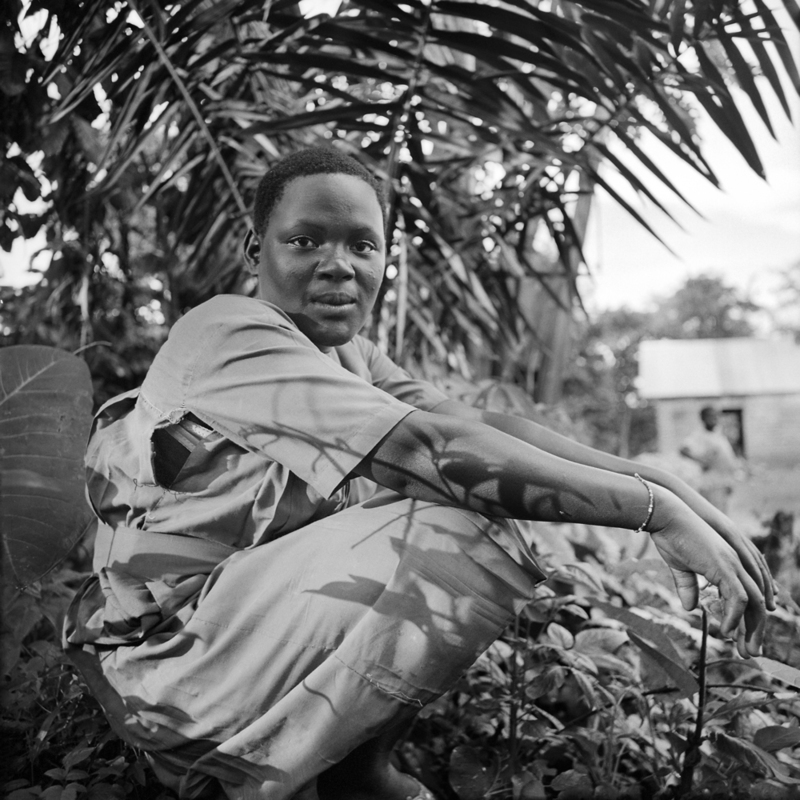 Robinah Kafuko Namulodo in the courtyard of her home at sunset. Though this photograph shows the more serious side of Robinah, there is no denying that this young woman is so full of life. She has one of the biggest smiles I’ve ever seen and is one of the brightest pupils at BESO Junior School. Athieno Jane in her kitchen frying kabalagala (banana pancakes) to sell at market for supplemental income. Jane is an amazing and fierce woman, always with the biggest smile on her face and her heart beaming love. She is a major community organizer who was integral to the founding of the BESO Junior School and deeply involved in the Spark Process. She has gone on to found a collective of HIV positive community members to support each other in regular meetings and pool resources to afford transportation costs and access to far away health clinics that supply the medicine the group needs. As if that was not enough, she also cooks for over two hundred BESO Junior School children daily, and is working hard as a widowed single mother to send her daughter Namuguya to college in Kampala. 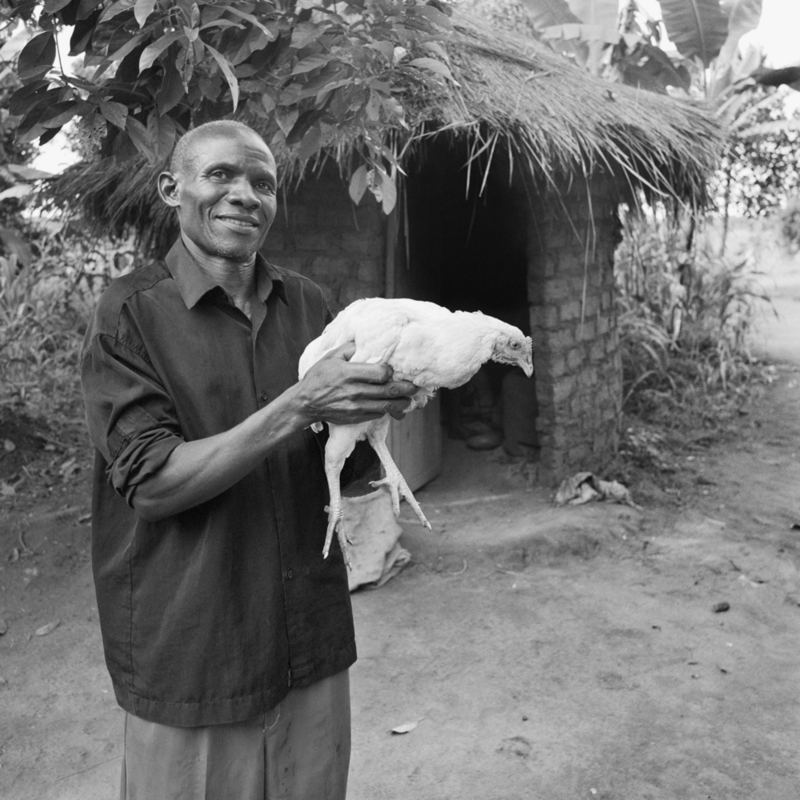 Waiswa John presenting a chicken to the photographer, as a birthday gift on 13 May 2014.